Gone to See Europe. Semester at Sea Spring 2013 Enrichment Voyage on the MV Explorer. Day 51: Southampton, England. 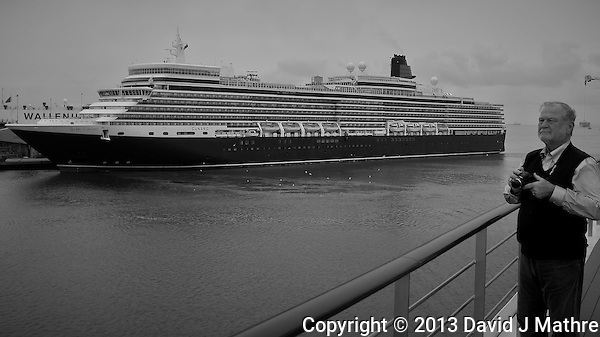 Queen Elizabeth (Cunard Lines) Docking in Southampton, England. Image taken with a Leica X2 camera (ISO 100, 24 mm, f/5, 1/200 sec). In camera B&W. Early in the morning I saw a large cruise ship all lit up from the window in my cabin. The ship passed us relatively quickly. Once we arrived in Southampton we saw that the large ship that passed us was the Queen Elizabeth.